Much as I adore the unadulterated, briny liquor of a freshly shucked, perfectly chilled oyster, it’s nearly impossible for me to resist the siren call of a simple mignonette. Just a teaspoon or so splashed atop said oyster is enough to ignite some kind of sensual magic, brightening and elevating the taste of the ocean, the sharp chill and silky texture of a plump little morsel. A couple of weeks ago, on a sultry summer evening I tasted a new (to me) mignonette variation at an Italian wine tasting event hosted by Winebow Inc. and Park City’s Grappa Restaurant. It took place on the tree house-like deck at the top of Grappa’s steep outdoor staircase (from which various intimate patios and decks may be reached). This setting is as close to a hillside town in Italy as you’ll ever get in these parts -- especially in summer or early fall when the town's little Main Street shimmers below and the hillsides are lush, all around -- so enjoy it while you can. 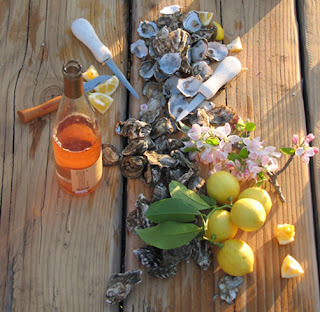 Photo from Hog Island Oyster Co. But back to the oysters and mignonette. Glass of delicate Zardetto Prosecco Brut Traviso in hand, I spied them: fresh-shucked oysters on ice, calling my name. Alongside the bivalves, three mignonettes in separate bowls, each with a small spoon. One was the classic, one was a citrus version and the other boldly offered a hint of lavender. Grappa’s classic mignonette was lovely -- nicely balanced and just what you would expect. The Lavender didn’t work for my taste, but the Citrus Mignonette was perfect. Laced with a bit of honey and reliant on lemon and orange zest as well as diced orange segments, it struck all the right notes. With the citrus and tropical fruit notes of the Prosecco, the bright sunshine and the chilled oysters, the perfectly balanced condiment was unforgettable. Chef Derek Gherkins was kind enough to share his recipe so I could share it with you. Place minced orange zest, lemon zest, and minced shallots in a mixing bowl. Heat white wine vinegar and honey together in a small sauce pot and pour over zests and shallots. Let cool. Once mixture has cooled add orange juice and diced orange supremes. (To make orange supremes peel off outer pith of the zested orange with a knife, then cut individual segments out with knife from between the pith, yielding just the meat of the orange.) Add a small pinch of kosher salt to taste. Mignonette is best prepared the day before to allow time for the flavors to come together. Want to know more about oysters in general? Hog Island is an excellent source. For as long as I can remember, I've had a love affair with condiments. That's what this blog is all about. See more in "About Me."